A living room or any space in your home makes a statement about your personal style. 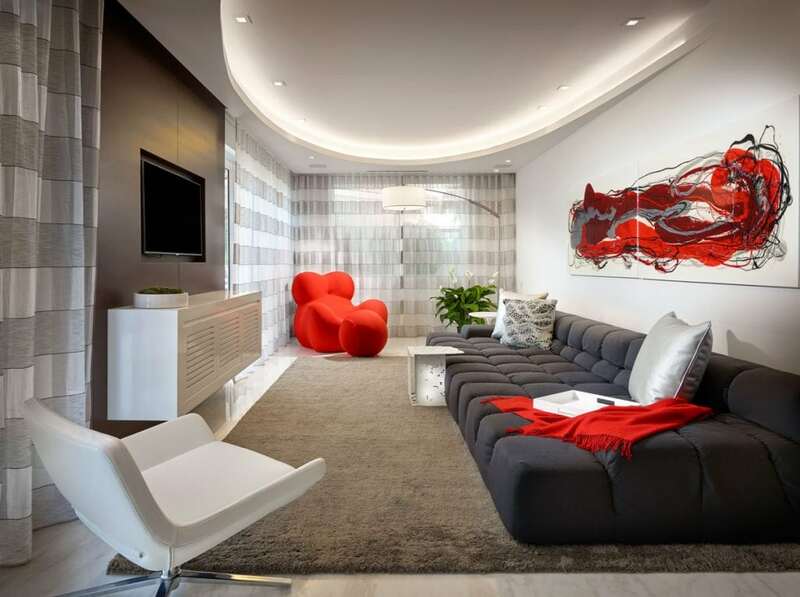 If you like clean lines and a minimalist design, you are attracted to modern interior design. So how can you reflect this modern style when designing a room? Here at the Pepe Calderin Design firm we specialize in designing Miami Beach apartments and other spaces with a beautiful modern style. Using photos of our work, we present the following key ways to design a modern living room. Neutral background tones create a sleek and minimalist feel. Colors such as beige and white can achieve this effect. A neutral background color also provides the perfect backdrop for a room with colorful accents as in this living room we designed. The beige walls, floor, and furniture allow the many touches of brown and red stand out. A focal point will create interest and enhance the overall feel of your room. You can have fun choosing a focal point for your room. It may be a fireplace, colorful piece of furniture or great piece of artwork. Check out the art installation we chose as a focal point for the room below. Interesting uses of bold and bright colors can create a focal point for the room. 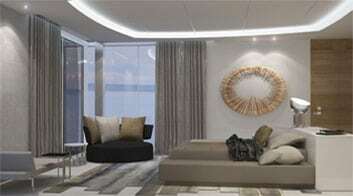 You can enhance the room with the use of color through lighting, furniture or other accessories. You can even paint one wall a different color. Unique uses of color are a signature of a modern style. We added a pop of color to the living room below with vibrant red furniture. The stark contrast to the white walls and other components really allow it to be a dramatic focal point in the room. As we explained, artwork can be used as a focal point. Artwork can also be used in more subtle ways. It can even be used to anchor a room. You can exhibit your style with the artwork of your choice, whether it is a beautiful sculpture or abstract painting. We added interest to the living room below with just a few pieces of unique artwork. The minimalist design that defines a modern style is created with angular shapes and clean lines. Keep this in mind when choosing your furniture and accessories. Square and rectangular shapes are examples of this. The cushioning should also be kept to minimum to create sleek lines. The living room below reflects the clean lines of the architecture with sleek furniture and exposed rectangular windows. These are just a few tips for designing a modern living room. Have fun with color and clean lines when designing with a modern style. Have you tried any of these design tips? You can explore more modern interior design projects by Pepe Calderin Design to see some of the great modern spaces we have designed. Have a space you’d like our design help with?